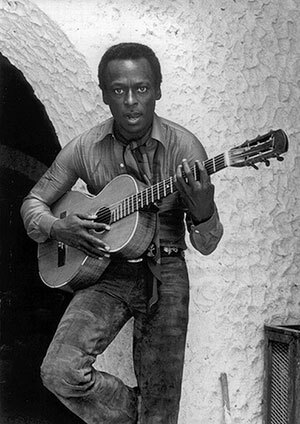 Miles Davis’ professional career spans 50 years during which he was on top of almost every important innovation in jazz. Miles Davis impressed by his performance, recordings, and also by his choice of sidemen. Though not a guitarist, studying Miles Davis’ lines can take your jazz guitar soloing chops and creativity to the next level. Miles began playing the trumpet when he was 13 and had his first professional gig when he was 17. He was 19 when he played in Charlie Parker‘s band and at 23 he made his first influential album as a bandleader, Birth of the Cool. A list of following influential albums is simply too big to produce here. Getting picked to play in a Miles Davis band was like putting a dose of steroids in your musical career. The list of guitarists who played with him speaks for itself: John Scofield, Mike Stern, John McLaughlin, and Robben Ford. Here is the theme of So What, from the Miles Davis album Kind of Blue. This first-take, unrehearsed Miles Davis session from 1959 is a true masterpiece. It was the key recording of what became modal jazz, a music free of fixed harmonies and forms. 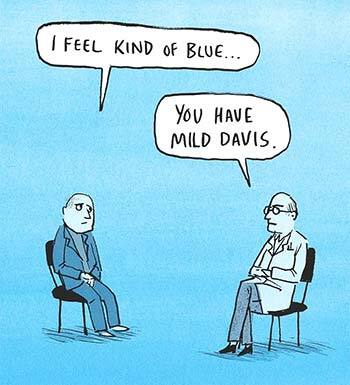 If Kind of Blue is not part of your collection yet, don’t hesitate and get it, it’s the best-selling jazz album ever. The band itself is extraordinary (proof of Miles Davis’s masterful casting skills), listing John Coltrane and Julian “Cannonball” Adderley on saxophones, Bill Evans on piano, and the crack rhythm unit of Paul Chambers on bass and Jimmy Cobb on drums. The composition itself alternates between D minor and Eb minor. 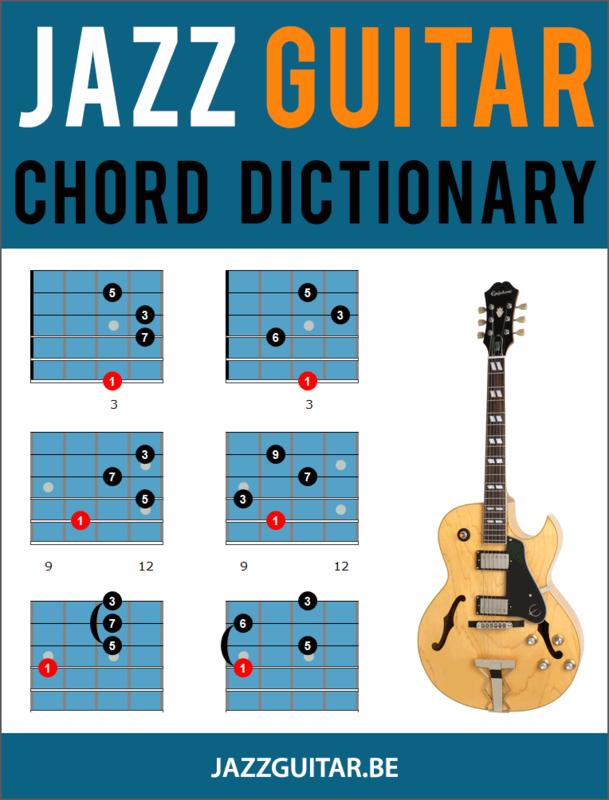 The chords that are being used are quartal voicings, a harmonic device made famous by Miles’ piano player Bill Evans. The structure of So What looks like this: 2x 8 bars D minor, 1x 8 bars of Eb minor and 1x 8 bars of D minor. Here are the first 16 bars of Miles Davis’ solo on Autumn Leaves (1958). Miles Davis uses simple melodic phrases in his solo, all in the Bb major scale, except on the Gm6 in bar 7 and 15, where he switches to Bb Lydian (=G Dorian) and emphasizes the natural 6. In the first 8 bars, Miles starts on the D (the 9 of Cm7), which becomes the 3 of Bbmaj7, going to the C (the b3 of Am7b5). In bars 9 to 16, he starts on the F (the 11 of Cm7), going to D (the 3 of Bbmaj7), to C (the b3 of Am7b5), to A (the 5 of D7), and finally to G (the 1 of Gm6). 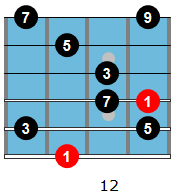 This ii V I lick in Bb uses typical Miles techniques as it snakes its way through the underlying chord changes. 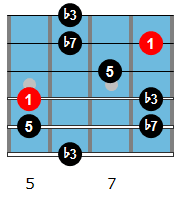 Notice the b9 drop in bar one (from the Eb down to the D), which is a characteristic of Miles’ playing. The use of the B (#11) to start the second bar, allowing for a half-step resolution of the C in the last beat of the first bar. The Eb-D movement (b7 to 3rd) that connects the last two bars. Before repeating this same up and down movement one more time to finish the line. Here is a typical bebop lick that comes from Miles Davis’ solo on Move, the first song on Birth of the Cool. The lick starts on D Dorian in the first bar, going to an Am phrase on G7, to a Dm phrase on Cmaj7, delaying the resolution. 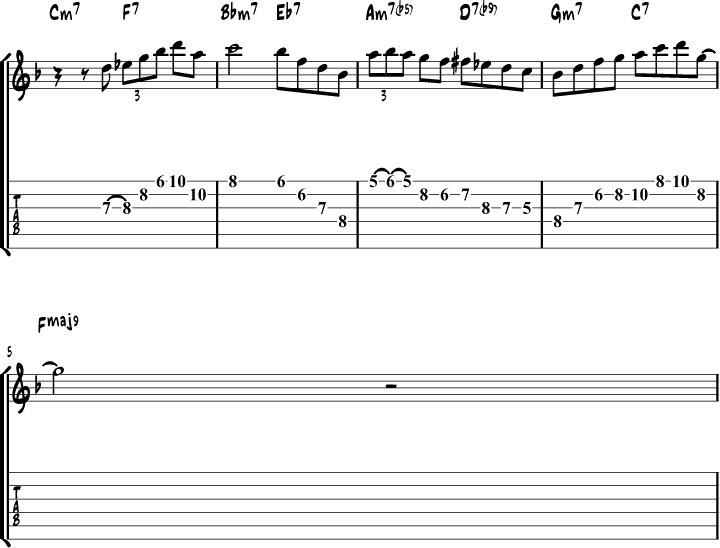 This lick on a short II V in C minor comes from Miles’ solo on On Green Dolphin Street. Notice the ghost notes in bar 2, producing some interesting phrasing which you can take out and use when practicing scales and arpeggios. This lick on a series of II Vs going to Fmaj7 is from a Miles Davis solo on Boplicity. Here is a Dm7 lick that uses a few chromatic notes (the A# lower neighbor and C#), hinting at D melodic minor to build tension during the phrase. The use of the C triad to outline the b7-9-11 intervals over Dm7. The line finishing on the 6th (B). 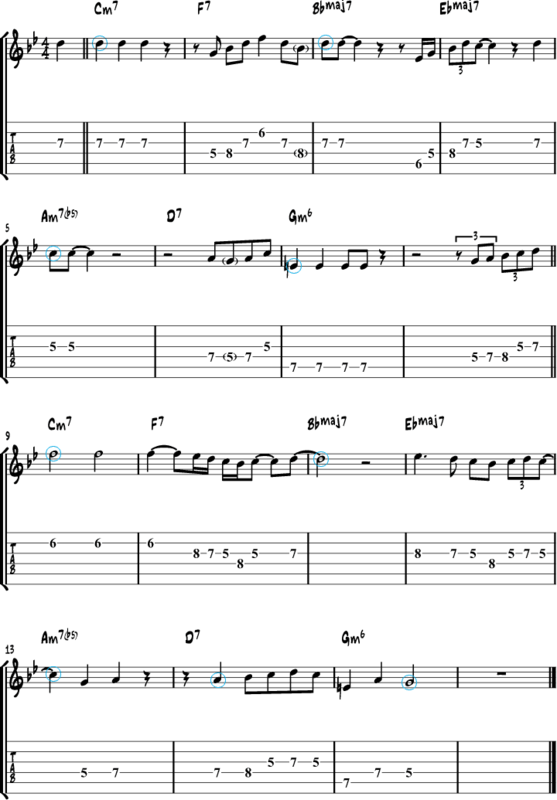 In this Dm7 lick, you are only using the notes from the D Dorian Mode to create this snaking line over the underlying chord. This simple, but effective lick is also from Milestones and uses the same Gm7 arpeggio. Thanks, … would be great if your lessons had PDF option. There’s a button at the bottom of the lesson labeled “Print & PDF” you can use to get the page into pdf. Unfortunately no pdf button at bottom. I view these lessons on an android phone. No button “Print & PDF” for me ( I use Mozilla Firefox). What about a link to get the Biab file for the backing tracks ? Amazing resource. +1 for the PDF please. This is a marvelous lesson. Thank you! One of the many great lessons provide. I love it, keep them coming. Thank YouSo Much!! “So What”. This is fabulous. I keep reworking it and am adding Miles’s leads. The sophistication is deceptively simple. I am considering taking it to a very small venue and letting the people sing the so what’s while I play the leads over the top. We’ll see how it goes!